Our – so to speak – historic department works on rubber foams and related products for cutting and using rubber foam sheets of various density to fit any kind of requirement: interior and exterior products, fireproof, made by Plastazote®, watergel and latest generation materials. By the combination of these materials and other products, specific for covering and filling, we obtain shaped and furniture cushions, custom-made by our client’s request. 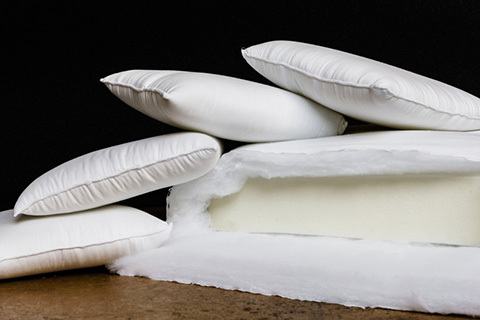 We don’t miss other options, like natural down, down & rubber foam, rollo-fill, polyester or wadding layer. Finally, at your disposal all the products that provide a healty and pleasant rest: pillows and mattresses with their coverings, also made by the combination of several products aimed to follow the needs and fantasy of our clients. 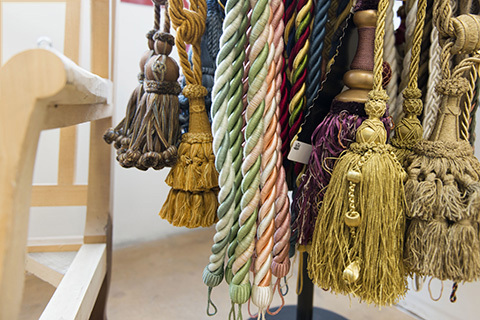 Recently developed, our new department is completely dedicated to the upholstering: from the smallest parts to interior and exterior curtains, here you can find all is required from those who work in this field, or from those who desire to decorate home personally. If you want to re-shape totally an armchair (including the covering) or transform completely your curtains, we can supply all the items you need, with a great selection of materials and colours. In the same way, in case you decide to leave us in charge of the technical part, we can fulfil any desire regarding the curtains, from the track construction to the fabric sewing.